If I've said it once I've said it 1000 times. If what you want to eat isn't on the menu ask to speak to the chef. Today while in Sylva NC we stopped for lunch at LuLu's on Main St. Sherri was craving a steak...not on the lunch menu the hostess told me. She then suggested maybe I could get a steak at Bogarts across town. Just then the chef and owner, Devan walked out of the kitchen. I asked him if I could get a steak and some fresh veggies....How thick would you like your ribeye's sir, he responded with a smile What happened next was wonderful. Fantastic aged USDA Chicago stockyard beef cooked over a coal fire to perfection. A platter of fresh local veggies which consisted of sauted spinach, broccolini, green beans with bacon and portabello mushrooms. All the veggies were cooked perfectly and coated with a bit of spice, sweet cream butter and olive oil. The steaks were a good 16 ounces each and melted in our mouths. Ahead of the steaks came a wonderful house salad of mixed fresh greens, sprouts and local black tomatoes. All dressings are home made and I chose lemon oil, Sherri chose ranch. The house cab was very good served in an overfilled large wine goblet for 4 bucks. By the time we had finished our meals and enjoyed 2 glasses of wine each we still had a good amount of food to bring home. The bill you must now want to know....$56.00 pre tip! I rate this meal a 10 out of 10. The place itself is not where you'd expect to find such a great meal but it is homey and comfortable, unrushed and personable. 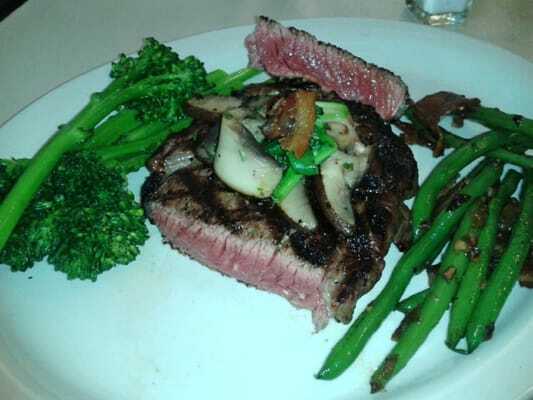 Next time you're looking for a great steak give LuLu's on main in Sylva a shot. Tell Chef Devan I sent you!